A grass_impostor_base material is used for impostors. It can be applied to grass objects. 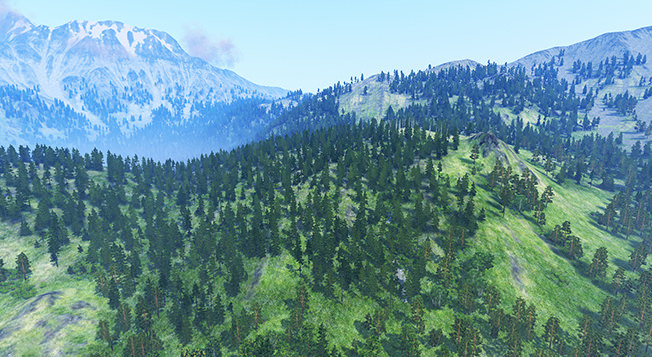 Rendering passes and options available for the material. Color noise - spatial color noise based on 2D texture. Ambient light - disable world light pass. Textures available for the material. 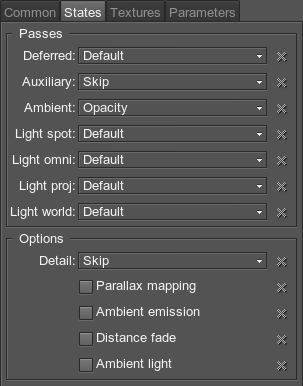 All of the textures fields have set default textures, which can be replaced by your own ones. Availability of some textures depends on the set States values. Diffuse - base material diffuse texture. Normal - base material normal texture. Spatial noise - spatial color noise texture. 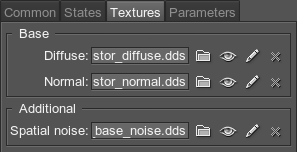 A Spatial noise additional texture is present only if Color noise option is enabled. Parameters available for the material. All of the parameters have set default values, which can be replaced by your own ones. Availability of some parameters depends on the set States field values. Impostor - impostor texture coordinates transformation. Auxiliary parameters are present only if Auxiliary rendering pass is set as Default. Stem noise - spatial noise scale. Stem offset - animation offset amplitude height scale. Stem radius - animation rotation amplitude scale. Stem scale - animation time scale. Alpha - grass alpha channel scale. Environment - environment texture lighting scale. 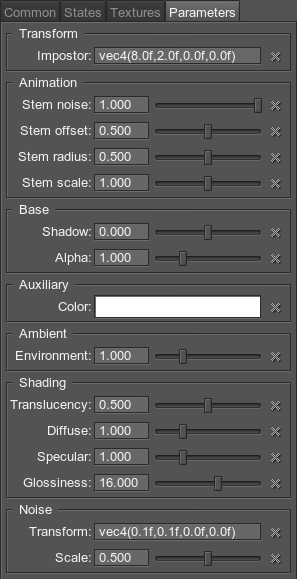 Diffuse - diffuse texture scale. Specular - specular texture power. Glossiness - specular texture scale.